This is my newest and greatest book to date. I have spent years writing this book and it is finally complete. It is by far my greatest literary achievement to date. If you are an advit reader of my material I would highly recommend this book to you. 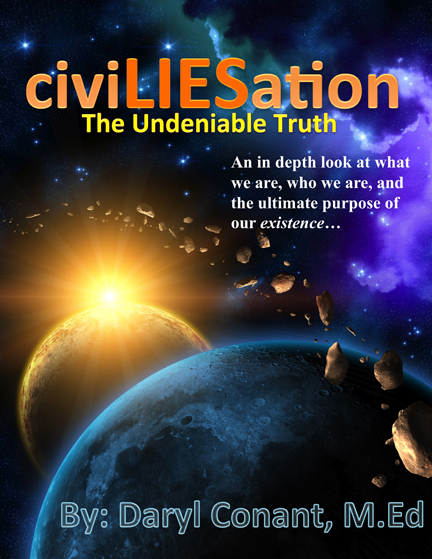 civiLIESation: The Undeniable Truth is an in-depth look at what we are, who we are, and the ultimate purpose of our existence. The cosmos is a grand miracle, and though we don’t know its origin or purpose, one thing does remain true and that is that the entire cosmos is made up of energy, the energy of creation. The Earth is a living biosphere that is a product of the atomic expansion of the universe. The Earth’s containment system allows for the sustainability of life. During the early stages of civilization life was reckless, barbaric, and uncontained. It would take thousands of years for the primitive energy to evolve into a sophisticated, civilized energy. One of the key factors for a shift in human behavior was through the conception of ego energy. The ego would be responsible for the governing power of civilization known as The Mass of Collective Energy. CiviLIESation explores illusionary perceptions, projections, and reflections of the ego. CiviLIESation is a presentation of conscious awareness. * Disease is a Manifestation of The Mind. * Nutritional Support to Boost Positive Energy. * How Fat Gain is A Result of Toxic Build up in The Body. * Strategies for Better Health and Longevity. * The Evolution of the Collective Awareness Spectrum. * What we Truly are, Who We are, and Our Ultimate Purpose of Existence.